Welcome everyone to the opening of the LAST spoiler season of 2013. It's been a great year! We've seen the cycle of shocklands finished in Gatecrash, ten new guild-aligned legendary creatures in Dragon's Maze, Archangel of Thune and Kalonian Hydra in M14, and some all new Legendary Enchantment Creatures in Theros (not to mention some awesome cards in From the Vault: 20 and the reprint of Sun Titan in Duel Decks: Heroes vs. Monsters). Let's start with what we know: two two cards revealed at PAX Australia/San Diego Comic Con: Jeleva, Nephalia's Scourge and Prossh, Skyraider of Kher. 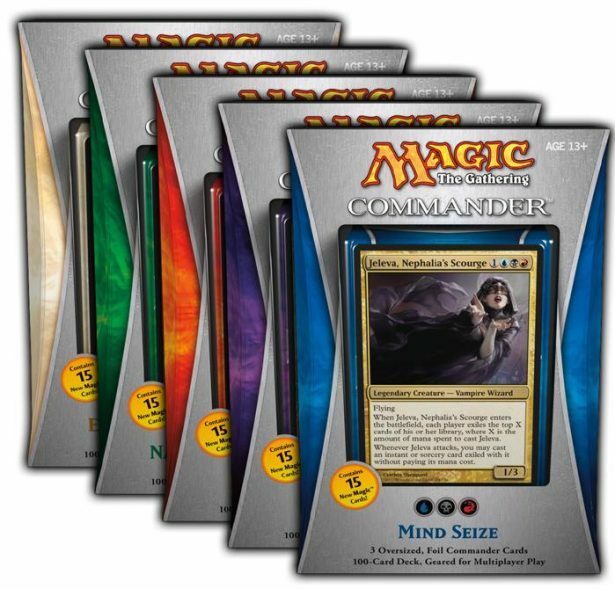 When we first got to see these, we assumed that the primary commanders would have something to do with the number of times it gets played from the Command Zone (which for you non-EDH players, is where your Commander/General lives until you pay the casting cost). Well, with the two new additions, that isn't necessarily going to be the case. 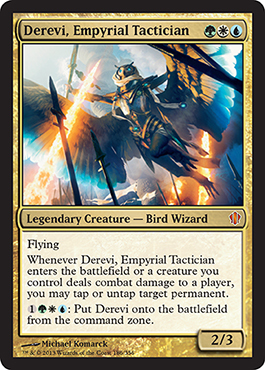 Jeleva comes from the plane of Innistrad (we just left there in the Standard format) and is a completely new card. She deals heavily with instants and sorceries, so much so that she exiles cards from everyone's libraries equal to the converted mana cost paid to cast her. And she she attacks (attacks, not deals damage), you get to play an instants or sorcery for free from any of the exiled cards. Neat, huh? Of course, she is a 1/3, which means she doesn't pack much of a punch (harder to get to that 21 damage from a Commander) and can easily be wiped by a burn spell. Of course, you might not want to kill her, because she'll just come back and take away more of the cards from your library. Continuing to analyze her, she's a vampire, but comes from Nephalia, which is the section of Innistrad more famous for Blue/Black and zombies. Stromkirk is the section for Vampires, but she certainly has the library manipulation skills of the Dimir (Blue/Black) guild. Her deck's name is called "Mind Seize." Prossh comes from the plane of Dominaria, which is/was central to the story of Magic. We haven't seen Dominaria for a while, but I think it shows up as the central plane for each Core Set. I could be wrong though. 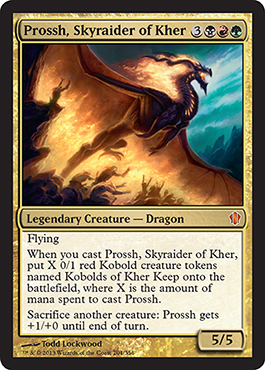 So, every time Prossh gets cast, you would get 0/1 kobold tokens equal to the converted mana cost. And then you can sacrifice creatures to pump Prossh by +1/+0. First time out, Prossh gives you six 0/1 tokens, which can be used as a boost to 11/5, quite a nice amount for trying to win by dealing the 21 Commander damage. Obviously a threat, but can easily pack a punch. 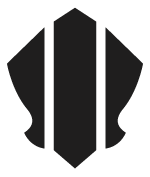 Prossh definitely fits with the color identity and Jund colors (Black/Red/Green) fit with the Jund shard of Alara, which also happens to be the color identity for dragons or anything related to dragons (since red is the central color, and Sarkhan Vol is from Jund and controls Dragons). Looking at her last ability, instead of paying (2*X)+(G+W+U), where X is the number of times you have cast her already this game, you only have to pay a maximum cost of 4 any time you wish to cast her. Pretty powerful! Our fourth spoiler so far comes from the deck called "Eternal Bargain" and this looks painful to play against, but wonderful to play with. So for six mana you have Oloro, Ageless Ascetic, a 4/5 creature that gives you two life during each of your upkeeps. Seems good. Whenever he is on the battlefield, you gain two life each turn. Then, when you gain any amount of life, you can pay one mana, and then you can draw a card and an opponent loses one life. Once again, interesting and good on the battlefield (NOTE: the life lost by an opponent does not go to the commander damage as it isn't dealt. The opponent just loses life). 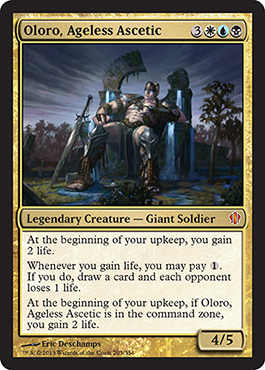 Now we get to the overpowered aspect: if Oloro is in the command zone during the beginning of your upkeep, you gain two life. So as long as Oloro is in the graveyard or battlefield, you still gain two life. The mana ability about card draw and opponents losing life can't be activated while in the command zone, however, so there is still a benefit to have him on the battlefield. 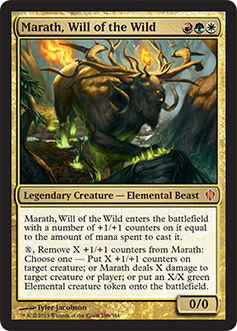 The fifth, and last, spoiler for this week is Marath, Will of the Wild. Marath shares the casting cost affecting the abilities, which actually appears to be an ability specific to the commanders that have red in the casting cost, while white and blue in the casting cost affect abilities while in the command zone. Anyway, I digress. So when he first comes out, he is a 3/3, and you can always take counters off and either put the counters on another creature, deal damage to creatures or players, or put a token on the battlefield with the removed counters. I get the feeling we'll be seeing some hydra action, cards putting counters on creatures (or maybe doubling counters?) and the like from this deck. All in all, I'm loving these cards so far. And this means we have 46 more new cards to be spoiled, along with full deck lists. Stay tuned!